When a Westerner thinks of Iran, they usually think of oppression and religious zealotry. What we don’t think about is the rich and vibrant artistic history that is still able to peek its head out every once in a while from underneath the dictator’s shadow. Film is one medium in which artistic people can express themselves in Iran. Most films coming out of Iran are strictly regulated and combed through to find any anti-Iran messages. In order to skirt around this, most filmmakers use children as their main protagonists. Seeing through a child’s eyes can allow the filmmaker to make allusions to the situations that normal citizens of Iran face without telling everyone outright. The most famous examples of these types of movies are the Cannes D’Or Winner The White Balloon and Children of Heaven. These movies are guaranteed to play big international festivals and become art house favorites while also slipping past the censors of this harsh government. Abbas Kiarostami started out making films about children, but moved quickly beyond this. He was not interested in the naturalistic and understated world that children stories necessitate. He also was not interested in big action films either. Instead he was interested in more Godardian questions. What makes cinema rich and powerful? Why do individuals use other individuals to accomplish their own needs? He answers both of these questions in unexpected ways in one of his first break out movies on the international stage: Close-Up. Close-Up is a combination documentary and fictional drama using non-actors. The story is simple, but the execution is where it gets complicated. A man was caught impersonating a famous Iranian director for this well to do family. Although he did take a small amount of money from him, his real motivation was just to become something he is not. He induces the family into starting rehearsals for a movie he wanted to make about them. The family’s son was also really into cinema and was excited to finally become a part of something that he normally would not get to do. This family only finds out after they congratulated him on a prize he had won at an Italian film festival that he was not aware of despite the article saying that he sent a letter of thanks. The patriarch files a report with the police and the man is sent to jail. This is where Kiarostami gets involved. He hears about this story from a magazine article he read and immediately becomes interested in it. He travels to meet this man in jail and get him to explain why he did what he did. Once the complaint is dropped by the family and this man is allowed to go free, he convinces the family to reenact the events that transpired. Thus what we are seeing on the screen isn’t quite real, but what this family remembers to be real. During the court room scene, the man accused tries to explain why he did it. He explains his penchant for art and creating but also his lack of funds and know how to get anything done. The son of the family echoes this same sentiment earlier in the film. They both want to be a part of the film world of Iran but have no concept of how to achieve these dreams. I think this is what drew Kiarostami to the subject matter. He had the same ideas and wants but he was lucky enough to receive the education and the chances to become what these two people will probably never become. Instead they are doomed to poverty or traditional work in order to earn money. 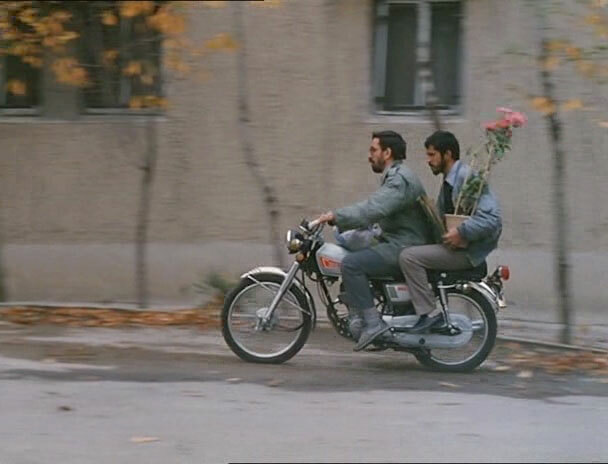 Kiarostami gave these people a chance to shine, if only for a little bit. They were allowed to act, and become a part of film history. I think this is what is most heartwarming about this film. The desperate need that all of these people want to make art and become famous is fulfilled, if only temporarily.